Olga is a math professor originally from Saint Petersburg, Russia. She spent the past 8 years living in Kiev, Ukraine before moving to Vancouver with her husband 8 months ago. Olga now spends her time studying English and exploring Vancouver. In her free time, she enjoys taking pictures, making new friends and exploring the beautiful landscapes of Vancouver by foot or on a bike. We asked Olga a few questions about her experience with Mobi by Shaw Go. Thanks Olga! Mobi: When was the last time you rode a bike? 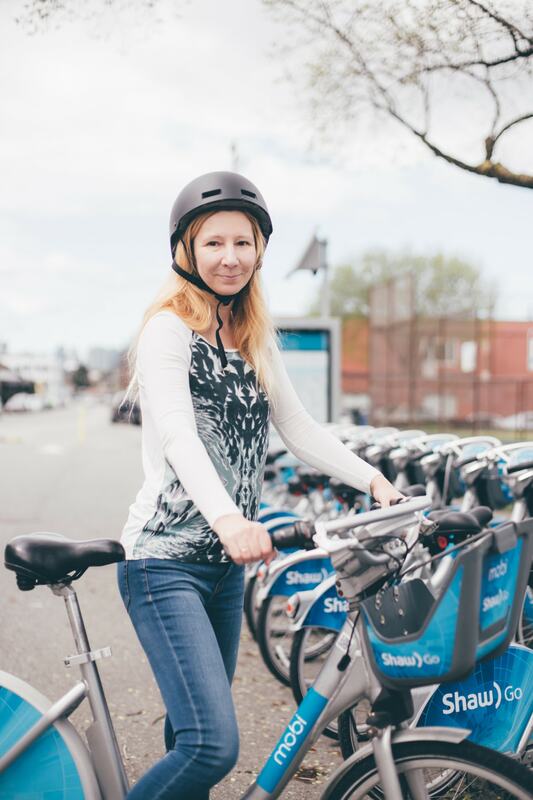 Olga: I bike in Vancouver regularly! Today was the last day when I rode a bike. I always like to ride bikes but in my city we do not have a great opportunity to do this. Before joining Mobi, the last time I rode a bike was last year in Kiev. My father and I rented bikes and made a trip around the beaches on the Dnieper River. Mobi: How do you integrate Mobi by Shaw Go into your daily routine? Olga: I use Mobi every day that the weather is nice to commute from English classes to home. Also, Mobi helps me when I am commuting to nearby stores. Sometimes if transit takes longer than a bike ride, and there are dock stations in the right place, then for me it's much more convenient to use the bike. Mobi: Where is your favourite place to ride a Mobi by Shaw Go and Why? Olga: I’m lucky, my house and my English school at ISS of BC are on 10th Avenue, which has a bike lane. I take a bike from the dock station located directly in front of my school and after the trip I put the bicycle in the parking lot right outside my house. 10th Avenue is very calm street with beautiful houses surrounded by trees, bushes and flowers. Some parts of the avenue are so beautiful that I sometimes stop and take pictures. As it turns out, even the city recognized this street as worthy of attention and awarded the title “Most Beautiful Block” in 2000 to my favourite part of the avenue :-). Mobi: What is your favourite part of Mobi by Shaw Go? Olga: I love the freedom that cycling with Mobi gives me. It is very convenient that I can take the bike when I want and do not have to think about where to park it, how to shelter it from rain or snow, or how to keep bike’s maintenance. If I cannot ride back home when I’m tired or the weather has worsened it is okay to leave it. The Mobi by Shaw Go service is great; all bikes are clean, in working condition and with inflated tires, so I am free of any worries about the bike. I have only advantages of using the bike and enjoy cycling. Mobi: Do you have any Mobi by Shaw Go tips or tricks? Olga: If you want to get distracted from your phone, think about your life, break out of your daily routines, dream, have time to process worries or concerns without a crowd nearby, then cycling will help you with this. And all this with breathing the fresh air of Vancouver could give your joy and happiness. Mobi: Any messages you would like to pass on to those thinking about getting a Vancity Community Pass? Olga: The fact that you can use all the benefits of bike riding for the price of several cups of coffee for a year with Vancity Community Pass is awesome. Every day you can take a bike and have fun commuting the city.